Jerome Nadel is the CMO at Rambus. He joined in 2012 to help transform the company’s business model from IP licensing to products and services. Jerome is a pioneer in user experience and service design, which he applies to product and corporate marketing. 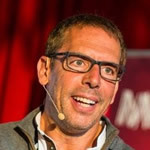 Jerome has had a variety of chief marketing officer and chief user experience officer roles at companies including Human Factors International, SLP InfoWare, Gemplus, and Sagem.